Obituary for Manuel Fernandez | Young Funeral Home And Cremation Services, LLC. Manuel Fernandez of Langeloth, PA passed away peacefully at 4:00 p.m., Monday, April 1, 2019 in Washington Hospital with his Family and Friends at his side. Manuel was a faithful servant of the Lord. Manuel now joins his wife Olga, the love of his life, and many loved ones in Heaven. Born in East St. Louis, Illinois on July 2, 1923. Shortly thereafter, his Family moved to Donora, PA. Manuel was the son of Joseph and Consuela Fernandez. Manuel served his Country in World War II where he received the Philippines Independence Ribbon, the Asiatic Pacific Campaign Medal, Good Conduct Medal and the World War II Victory Medal. On returning from service, Manuel met Olga Fernandez in 1947. 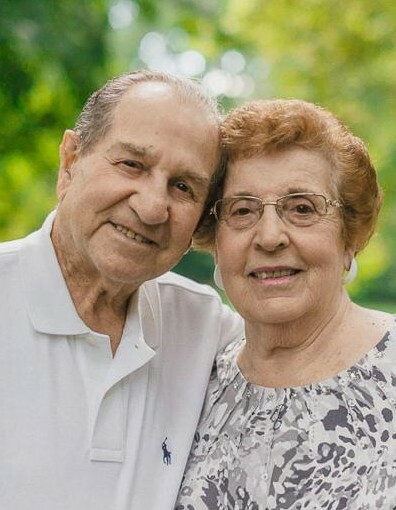 On June 4, 1949, they were married and began what was to become a 70-year journey of love and affection.Manuel and Olga would live in Donora, PA until Manuel took a job with Weirton Steel. Manuel and Olga moved to Langeloth in 1966 where they built their current residence across the street from the soccer field where they had met in 1947. Manuel would retire in 1985 from Weirton Steel but would continue to work on various projects in Pittsburg with his son’s, Eric and Robin until finally retiring in 2013 at the age of 88. Manuel dedicated his life to being a wonderful husband and a role model Father. He will be deeply missed by his son Eric and his wife Corinne of Chicago, IL and his son Robin and his wife Ann (beloved Caregiver) of Sewickley, PA. He also leaves behind his beloved grandchildren, Mina Fernandez of New York, NY and Ricardo Fernandez of Sewickley, PA. Brother, Marino Fernandez of California and many nephews and nieces. Cousin, Lana Longstreth and children; and many close friends including Gloria Sergakis, Harry and Marlene Pappas and Rich and Patty Ginoski, David & Mary Jo Vallina. In addition to his parents, Manuel was preceded in death by brothers: Thomas Fernandez, Joe Fernandez; sisters, Lena Garcia, Consuela Perez and Julie Mackey. Friends received at the Young Funeral Home & Cremation Services, Inc. 23 Erie Mine Rd., Burgettstown, PA 15021 (724) 947-2049 www.youngfhinc.com ,on Thursday, April 4, 2019, where the family will be present from 5:00 p.m. to 7:00 p.m.
Reverend Clarejean Haury will officiate a prayer service on Friday, April 5 at 10:00 a.m. at the Young Funeral Home. Manuel will be laid to rest in a private service at The National Cemetery of the Alleghenies in Bridgeville, PA.
Those wishing to do so may make gifts in Manuel’s memory to the American Heart Association.